For many reasons, the summer capital city Srinagar in Jammu and Kashmir should be your bucket list destination. 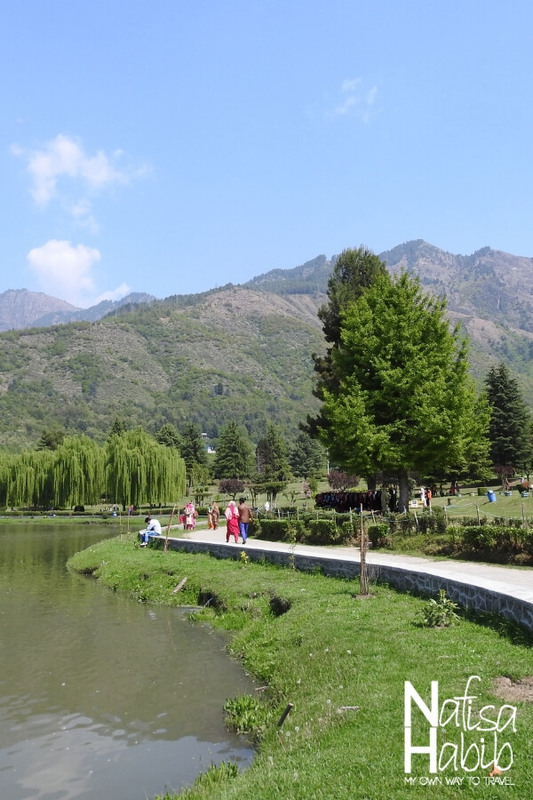 Srinagar mainly popular among tourists for Dal Lake, one of the top attractions among many beautiful Mughal gardens, holy and historical landmarks. Majestic Zabarwan Mountain Range with a peaceful view of the Dal Lake is something you’ll love to adore during your stay in the city. 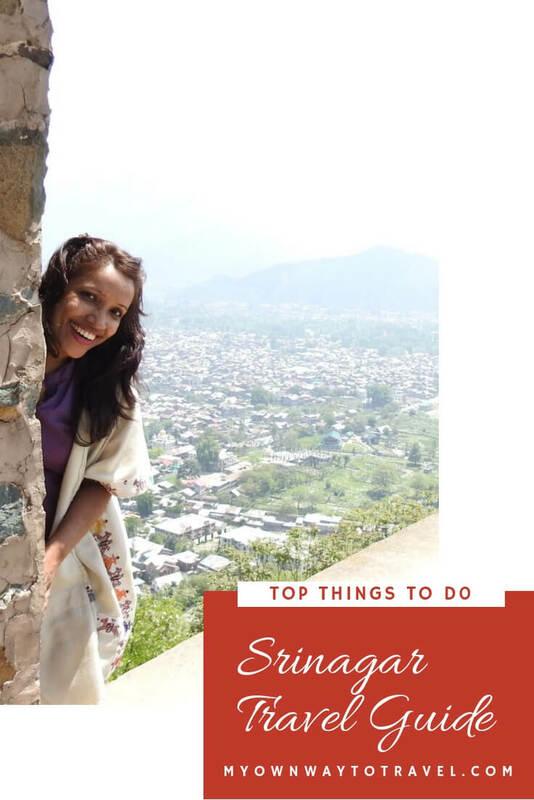 Here is the Srinagar travel guide based on my solo travel in Jammu and Kashmir, India. In two days I explored many top attractions and found many best things to do in Srinagar. 6 Are You On Pinterest? Click To Save These For Later Read! Spring (March-May) to summer (June-August) is the best time to visit Srinagar. The weather is not so cold and pleasant in between this time. So you can expect the average temperature between 12-30 degree Celsius. However, Kashmir, the paradise on earth has its unique beauty in almost all seasons. If you don’t miss to explore Asia’s largest Tulip garden, then April is the best month for you to visit Srinagar. April is also the peak time to travel Srinagar. The city is well connected by road, rail, and air. 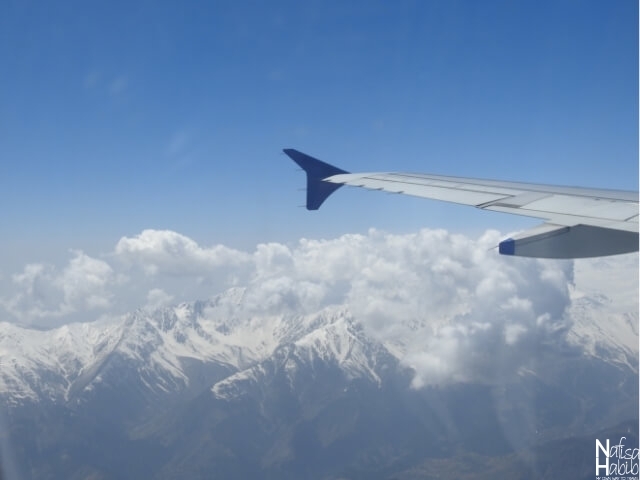 You can travel Srinagar by air from major cities like Delhi, Mumbai, Chandigarh, Amritsar, Bengaluru, Ahmedabad, Lucknow, Leh, and Jammu. Srinagar Sheikh ul-Alam Airport has regular domestic flights from those cities. Many regular buses and trains also run to reach Srinagar. Srinagar Railway Station is connected with Udhampur and Jammu Tawi Railway Stations. You can enter directly to Srinagar by bus or private taxi from those stations. Seven days I was in Srinagar. 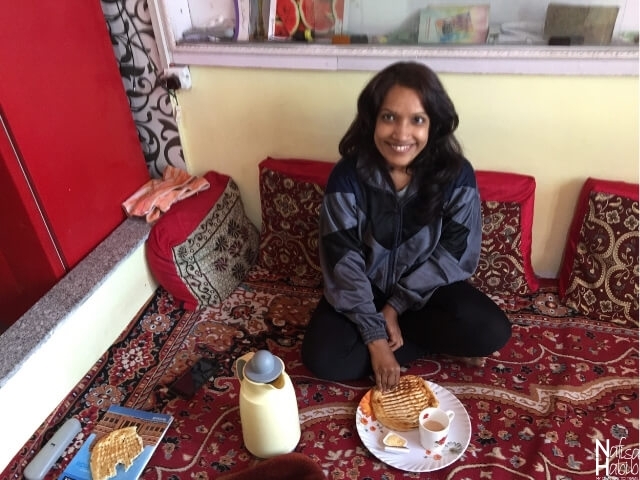 I’ve stayed five nights in the city and two nights had a budget-friendly stay in a houseboat on Dal Lake. However, two or three days are enough to explore the central city of Srinagar. I found it is even possible to enjoy a day trip to the famous hill stations Gulmarg and Sonmarg from Srinagar. 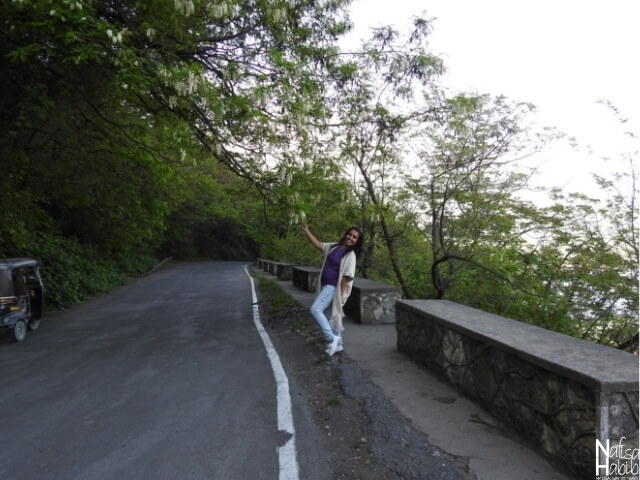 Two days I kept for city sightseeing, two days was for a day trip to Gulmarg and Sonmarg from Srinagar. And last two days enjoyed the beauty of the Dal Lake by staying in a houseboat. You’ll find many ranges of hotels, resorts, guest houses, and houseboats for accommodation. Most of the hotels located in the Dal Lake area on Boulevard Road. The central tourism hub of Srinagar. Centaur Lake View Hotel, Vivanta Dal View, Fortune Resort Heevan, Kashmir Mahal Resorts, Hillscape Inn, The Lalit Grand Palace Srinagar, and Hotel Brown Palace are some of the best hotels offer Srinagar Dal Lake view. I had a budget trip in Srinagar, and I’ve stayed at Hotel Grand Labeeb, a bit away from the central city near the fire service station. Every day I loved morning walk from the guest house to till Khayam Chowk. Khayam Chowk is a famous street in the city for street food lovers, and also you’ll get many budget accommodations here. Once you reach Srinagar, it is possible to directly hire a taxi from Srinagar International Airport to get around the city. 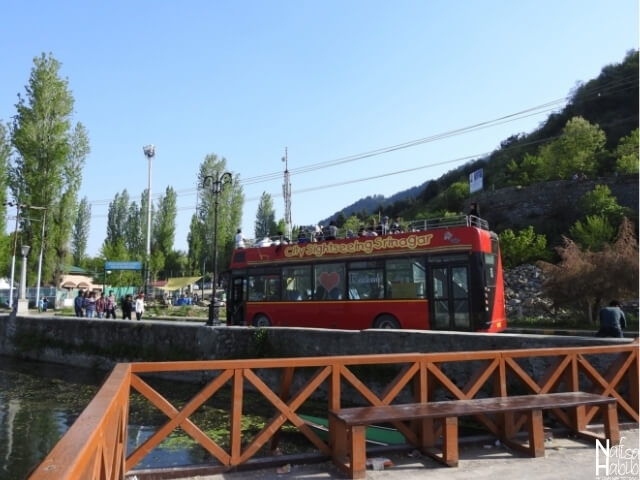 There are also special City Sightseeing Srinagar bus services for tourists in the city to explore top attractions in Srinagar. You can also visit many Srinagar gardens by Kashmiri Shikara or boat from Dal Lake. To explore many city top attractions you don’t need to spend much on the admission fee. Admission fee for different Mughal and botanical gardens are budget-friendly and affordable. For two days I’ve hired one auto rickshaw or tuk-tuk and moved around the city. 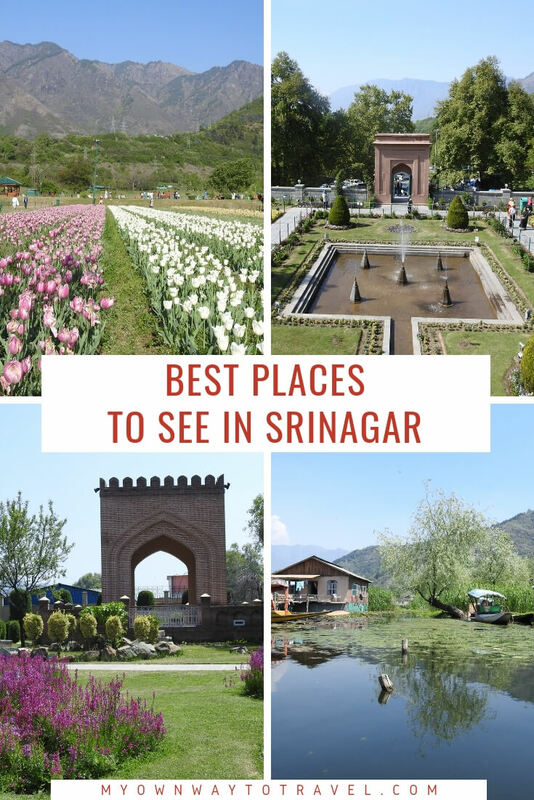 The first day in Srinagar I visited Hazratbal Shrine, local market of the Shrine area, Shalimar Bagh, Srinagar Botanical Garden, Chashma Shahi, Nishat Bagh, Indira Gandhi Memorial Tulip Garden, Pari Mahal, and Dalgate Road for exploring Srinagar street food. 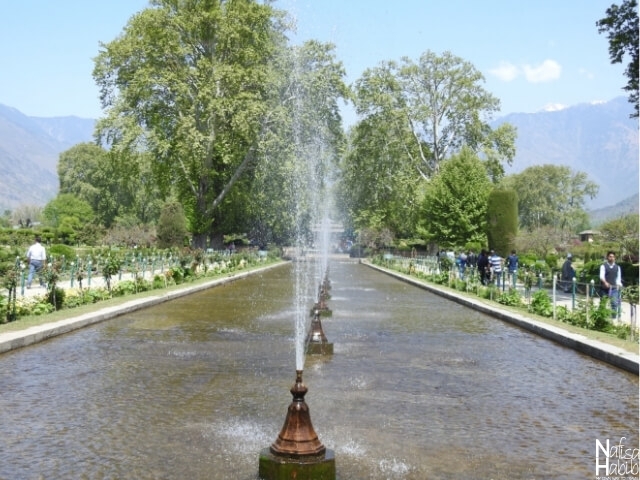 All Srinagar gardens are not much far away from each other and so easy to visit at a time. 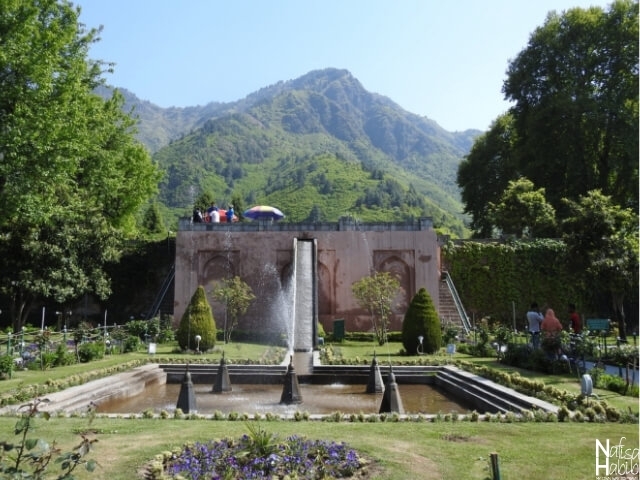 Srinagar Botanical Garden is one of the most beautiful gardens within 80 hectares of land. It maintained very nicely and built in 1969. I loved the rows of many poplar trees here. 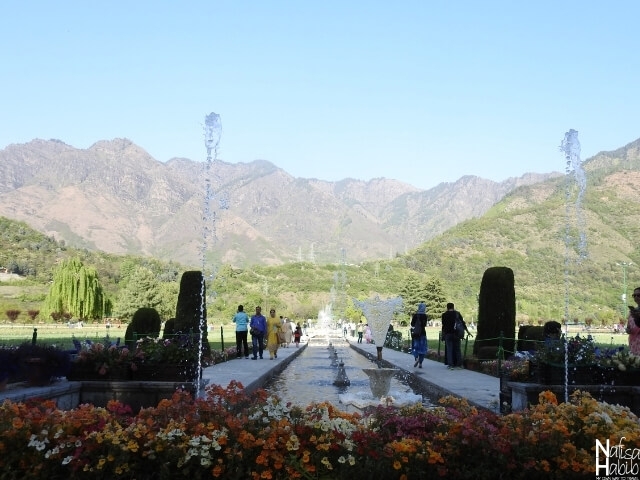 This Botanical Garden is also known as Jawaharlal Nehru Memorial Garden, a must-visit besides many Mughal Gardens in Srinagar. The second day first started from Hari Parbat Fort; you have to get a ticket to take an entry to this beautiful spot. Then Badamwari Garden, Jamia Masjid, Wooden Bridge, and Shankaracharya Temple. Badamwari is another beautiful Srinagar garden to see in the city. There are many almond trees inside Badamwari Garden. Spring is the best time to see the blooming of violet colored almond flowers in the entire garden. Early morning walk is a favorite activity here. The mountain view from this garden is just breathtaking. 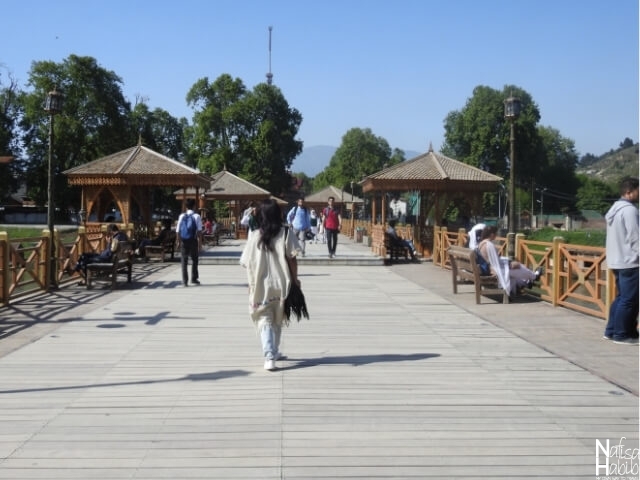 If you have time, you may also love some time walking in a wooden bridge in Srinagar. 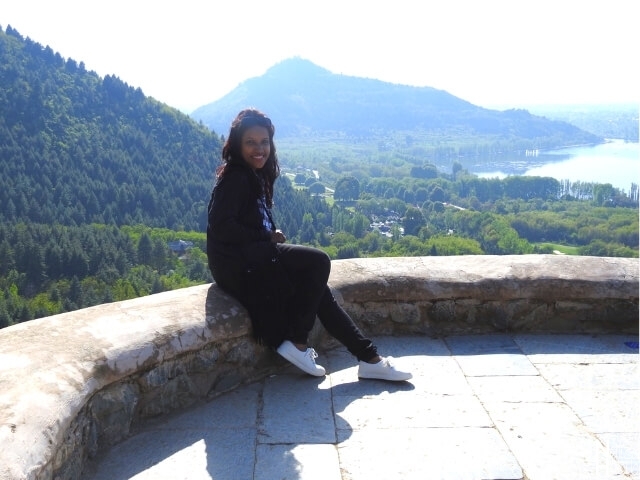 I found here many young peoples enjoying their time; there is a place to sit, and the mountain view with the lake is beautiful from the bridge. Srinagar is the Venice of the East; many lakes are there around the city. Dal is the popular one, and Dal Lake Shikaras carries the cultural symbol of Kashmir as well as Srinagar. The best part of the lake is the backdrop of the Zabarwan Range and the breathtaking water reflections. Char Chinar or the Island of Char Chinar is the picturesque beauty of Dal Lake. A scenic boat ride on Dal Lake is one of the best things to do in Srinagar. Many shikaras are always ready in a different ghat of the Dal Lake. You can hire any boat for some hours or a short time. The actual price list of Dal Lake shikara boat ride is available in the ghat. I enjoyed different activities on Dal Lake. 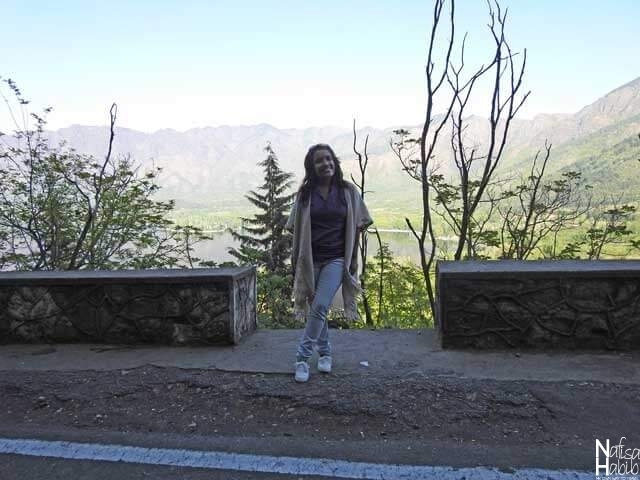 The scenic journey to Srinagar Dal Lake was fun and romantic. One or two nights stay in a houseboat will give you a unique experience and the chance to explore the peaceful beauty of Dal in the different hour of the day and night. Dal Lake houseboats are like floating palaces. Many ranges of houseboats are also available, and you’ll get all the facilities like hotels during your stay in Srinagar houseboat. I had my best two nights at Shamus Maqbool Houseboat. 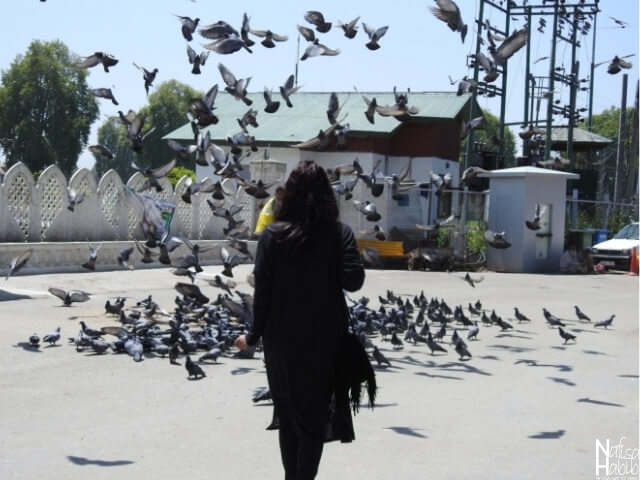 It is the memorable part of my solo travel in Srinagar. 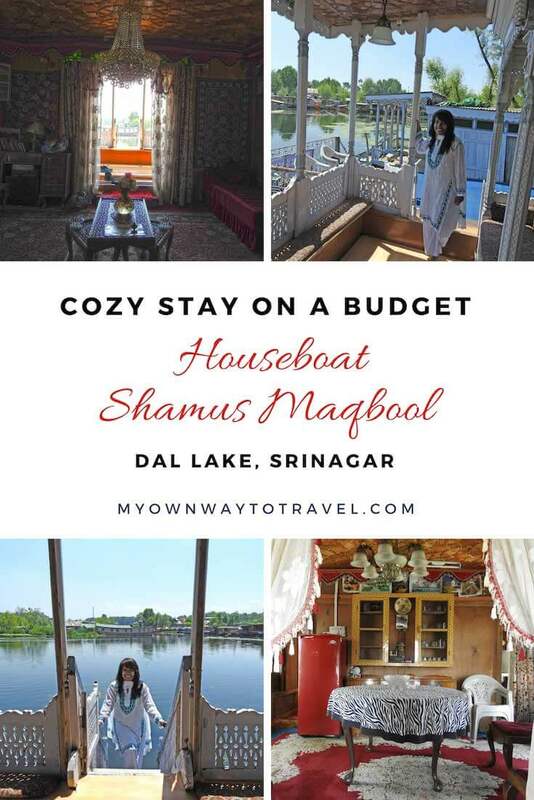 You can directly stay in a houseboat instead of a hotel in Srinagar from the airport. Later can explore the city by shikara or boat. 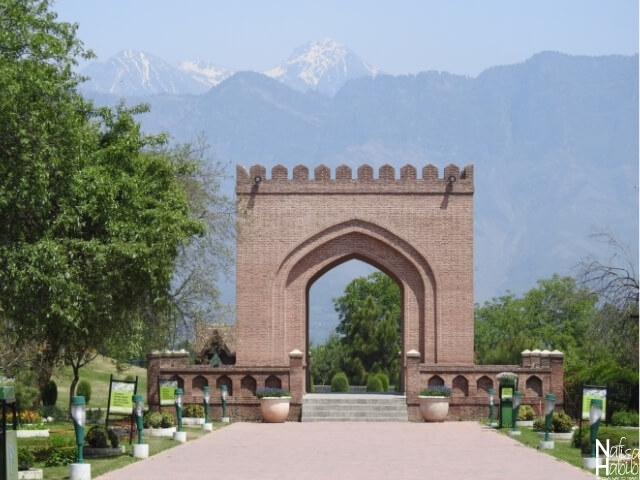 Visiting many beautiful Royal Mughal Gardens are one of the best things do in Srinagar. 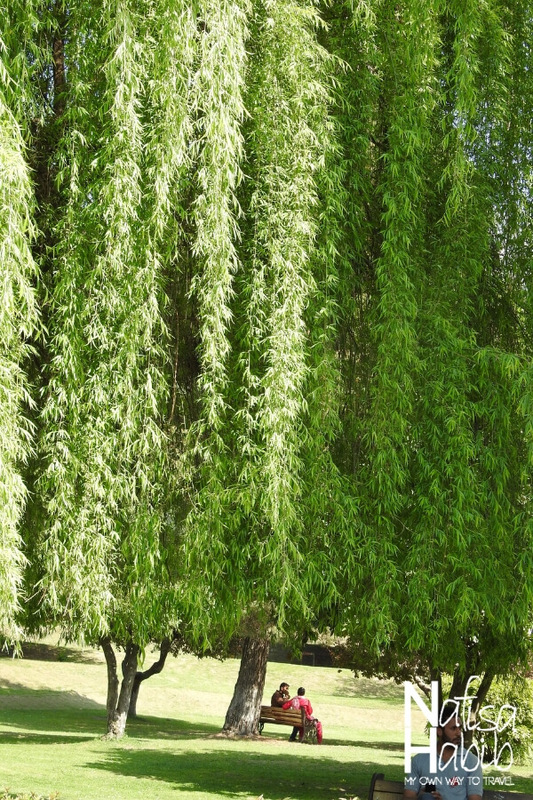 You’ll love to spend some relaxing time in each of them to bury your any headache. Some notable and must-visit gardens are Shalimar Bagh, Nishat Bagh, Chashma Shahi, and Pari Mahal. I loved the extraordinary beauty of Nishat Bagh and Pari Mahal the most among all of the Mughal Gardens of Jammu and Kashmir in North India. Shalimar Bagh is also known as the Crown of Srinagar and built in 1619 by Mughal emperor Jahangir. It is located on the northeast side of Dal Lake. The total area of the garden is 12.4 hectares. There are three terraces of the garden and many fountains — the best time to visit during spring or autumn. The extreme beauty of the green or red colored leaves of the traditional Chinar trees is awesome during those seasons. The beautiful terraced Mughal Garden Nishat Bagh is also known as the Garden of Spring. It is built in 1633 by the elder brother (Asif Khan) of Nur Jahan, wife of Mughal emperor Jahangir. The total area of the garden is 19 hectares. It is located on the eastern side of Dal Lake. There are twelve terraces inside the garden, and you’ll love the spectacular view of the Zabarwan Mountains from the garden. The Royal Mughal Garden Chashma Shahi is also known as the Royal Spring. It is built in 1632 by the governor (Ali Mardan Khan) of Mughal emperor Shah Jahan The total area of the garden is just one acre. There are three terraces inside the, and the main attraction is the holy water of the spring. You’ll also be able to see the remote view of Hazratbal Shrine and Dal Lake from the garden. Pari Mahal is a seven terraced Mughal Garden at the top of the Zabarwan Mountains. 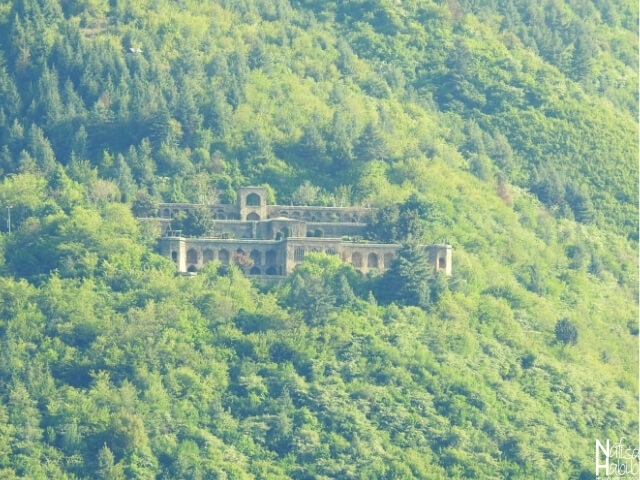 It is built in 1650 and also known as The Palace of the Fairies. Srinagar city and the southwest side of Dal Lake view is possible to enjoy from this beautiful Srinagar garden. 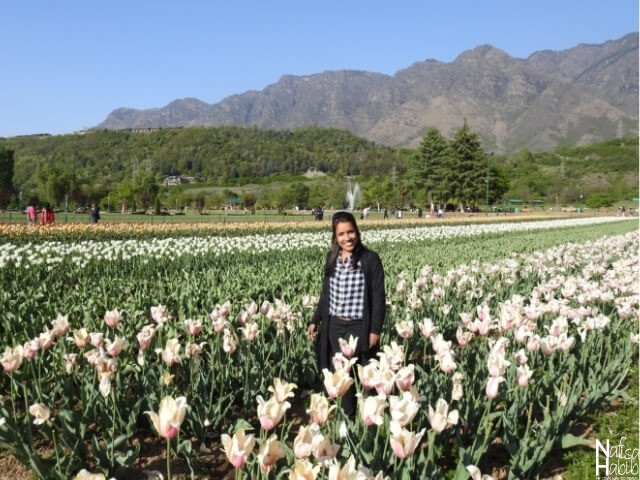 Indira Gandhi Memorial Tulip Garden is one of the top attractions in Srinagar to explore Asia’s Biggest Tulip Garden in the month of April. Tulip Garden is 5600 feet above the sea level. You’ll find almost 12.5 million colorful tulips spread over total 30 hectares area of the garden. The picturesque view of the Zabarwan Mountains range from the garden is also breathtaking. First two weeks of April are the best time to visit the garden where you’ll see the rows of white, red, pink, yellow, violet, and black colored tulips. The remote view of Pari Mahal is possible to see from this beautiful garden. 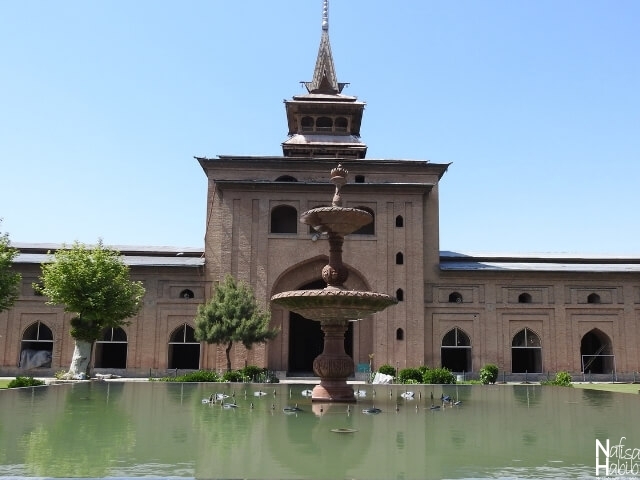 The oldest Jamia Mosque built in 1394 by Sultan Sikandar Shah Kashmiri Shahmiri (RA) and located in Downtown, Srinagar. Many interesting facts are there about the mosque. Srinagar Jamia Masjid can hold 33,333 peoples at a time for salah. It has unique architectural beauty and renovated three times. Jamia Mosque is one of the iconic landmarks of Srinagar. Every year the salah on the last Friday of Holy month of Ramadan is offered by lakhs of people in and outside of the masjid premises. The historical Hari Parbat Fort first built during the time of Mughal emperor Akbar in 1590. 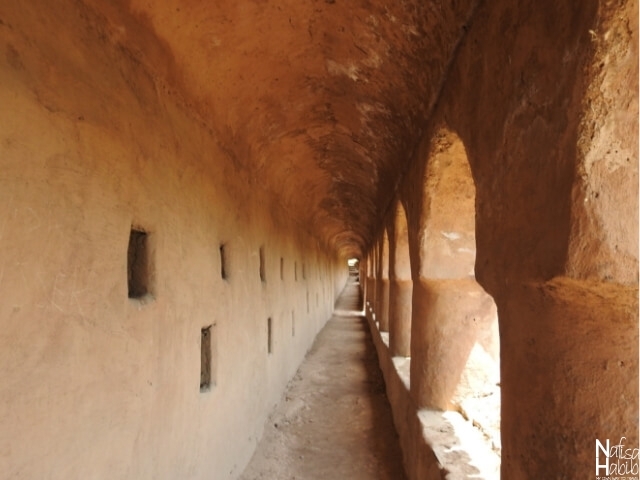 The present fort built in 1808 by Atta Mohammad Khan, one Afghan governor and located on the top of the Hari Parbat Hill. 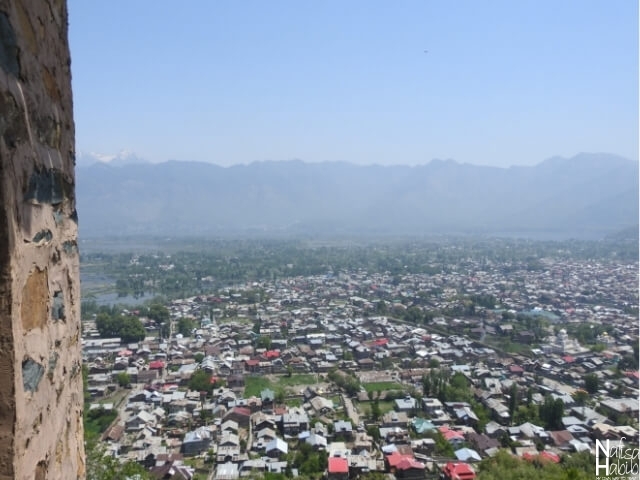 You’ll get Srinagar City top view from the fort. There is Muslim Shrines, Shakti Temple, and Gurudwara inside Hari Parbat. Shankaracharya Temple built in 371 BC and one of the top holy places to see in Srinagar. This temple is 1000 feet above the sea level and located on the top of the Shankaracharya Hill. You can enjoy the top Dal Lake view from the temple, but photography is not allowed. You have to pass more than 200 steps to visit Shankaracharya Temple, but before that, you’ll find one viewpoint of this Hindu Temple. Many visitors stop here, there is a place to seat and can enjoy the remote view of Hari Parbat Fort. The famous Boulevard Road offers the best view of Dal Lake with the Zabarwan Range. Chinar Ghat is a favorite spot on Boulevard Road, and you’ll see many locals enjoying their leisure time, sitting and talking or fishing with the Dal Lake view. The first day in Srinagar I’ve experienced the picturesque landscape of Dal Lake from Boulevard Road. The beautiful Nunkun Lake View Restaurant also located on this road where you can have tea or coffee and enjoy the view of Dal Lake. This restaurant is mainly best for Chinese cuisines and popular one in the city. Wazwan is a traditional Kashmiri cuisine and mainly served during the wedding and any big festivals. It is a popular non-veg delicacy throughout Kashmir and prepared with 15 to 30 dishes of meat (lamb). Some must-have items of Wazwan are Kabab, Rista, Goshtaba, Tabak maaz, and Rogan josh. You can order any of them and have with plain rice. I had Wazwan from Kareema Restaurant on Residency Road. The famous Ahdoos Restaurant is also best to try Wazwan. 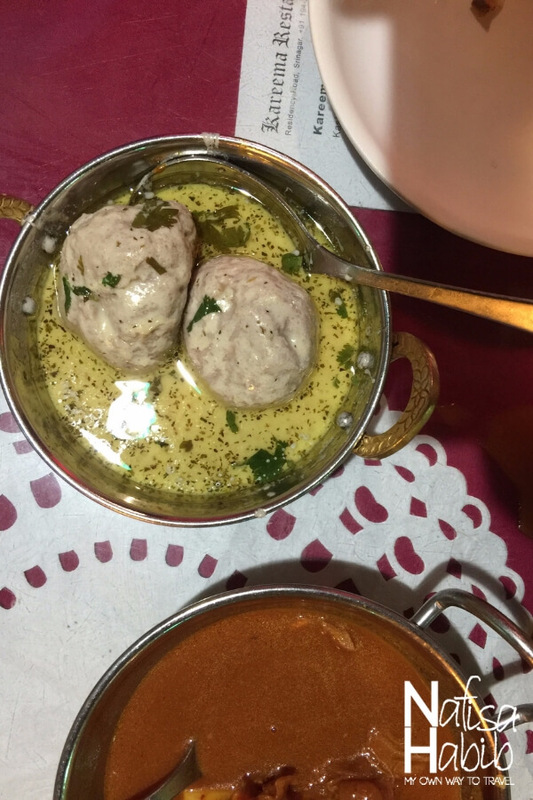 If you’re looking for vegetarian food, then Krishna Vaishno Dhaba Srinagar is best for trying many veg items. 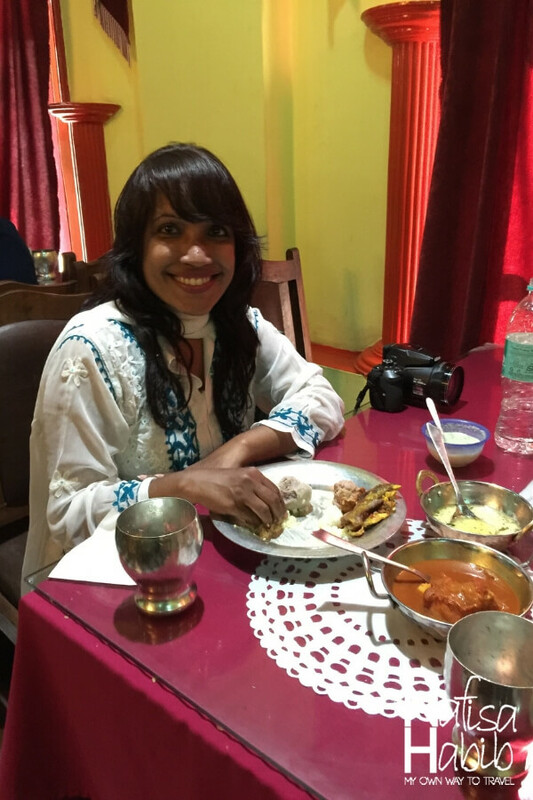 The pure vegetarian Krishna Dhaba restaurant located in Durganagh. It is fun to visit local food markets or food streets; how about you? In Srinagar, some of the best are Khayam Chowk, Dalgate Road, and Hazratbal Shrine area for trying Srinagar street food. Some favorite street food in the city is halwa paratha, crispy fries of potato and lotus stem, chicken tandoori, kabab, and barbecue. 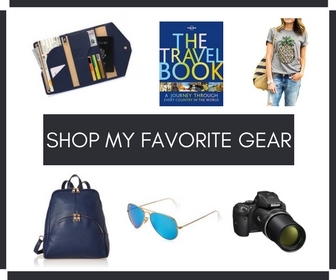 Furthermore, you might not love to leave the city without buying or collecting many souvenirs. Lal Chowk and many floating markets or Meena Bazar of Dal Lake are best to get many Kashmiri traditional items. Kashmiri shawl, pashmina, Kashmiri stitched salwar and poncho, carpet, walnut wood items, dry fruits, almond, apple, and apricot are some of the best Kashmiri products to buy from Srinagar. Share your favorite top things to do in Srinagar. Would you make it there for beautiful Dal Lake or Mughal Gardens? 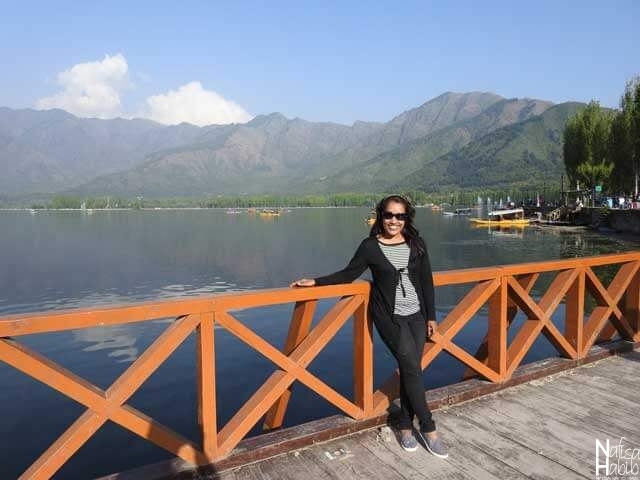 I didn’t know there is so much to see and do in Srinagar. I really loved the idea of staying in a houseboat. Hari Parbat Fort and Mughal garden look really wonderful. Being an Indian, I think I must plan a trip to Srinagar soon. Yes, staying in a houseboat is must, it has its own royalty and beauty. Moreover, you’ll be surprised to see the reasonable cost even for luxury Srinagar houseboat if you compare it with Alleppey houseboat. 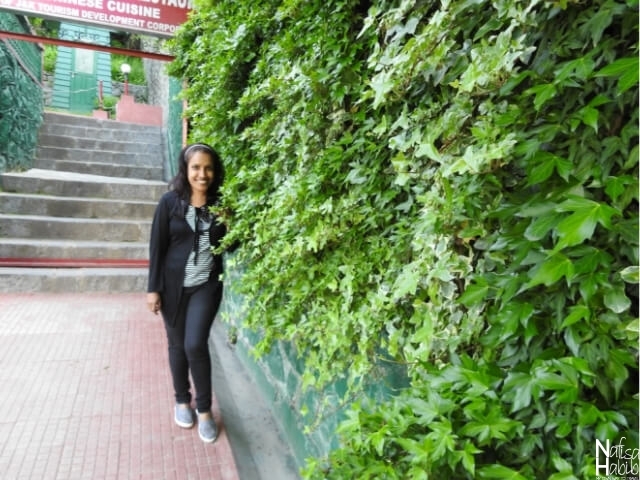 As someone who loves nature, Srinagar is a great place to visit for me. With so many gardens to visit, it sounds like spring time is the best time to visit this beautiful place. I’m particularly interested in the Indira Gandhi Memorial Tulip Garden. With over 12 million tulips at 5600 feet above the level, this garden is a marvel. The Mughal Garden Shalimar Bagh also piques my interest. I adore the design of the garden and its water fountains. Same here, I’ve found all peacefulness here being a nature lover. Truly you should visit and you’ll love to explore. Visiting Kashmir has always been my dream! I don’t know when I’ll be able to visit it, but I loved reading your article. 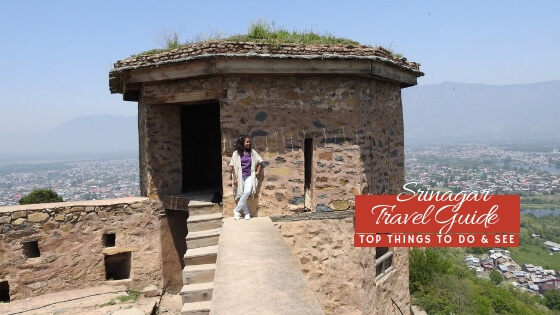 It felt like seeing a little bit of Srinagar through this article. Thanks a lot! I have to be honest, I had never heard of Srinagar before I read your article! It looks so beautiful with plenty of things to keep busy for a few days! This is definitely somewhere I will add onto my itinerary when I come back to India. That’s great, you’ll definitely enjoy exploring this beautiful destination in India.